Dean Ambrose is the only member of the Shield not to have captured the WWE World titleAnother member of the Shield reached the apex of pro wrestling last week (albeit briefly) when Roman Reigns captured the WWE World Heavyweight Championship at Survivor Series.It is quite possible that the Shield would become the first stable of debutant wrestlers who would all go on to capture the World title in the future. But for that to happen, the final piece has to fit the puzzle. The name of the missing link is Dean Ambrose.Things have come full circle for Ambrose ever since his RAW debut in 2012.Back then, Ambrose was the only member of the Shield who would capture a singles title and he seemed set to walk into the heel role once the Shield split. However, his United States title reign seems a distant memory now and the heel persona seemingly positioned for him was handed over to Seth Rollins, who performed admirably in that role.However, ever since the split of the Shield, it is Ambrose who has been receiving the most cheers from the crowd. A significant section of the fans despise the apparent heir that is Roman Reigns and consider Rollins to be more of a tool to Triple H than anything else.Despite the fans behind him, why does Ambrose remain an afterthought in the WWE title picture? 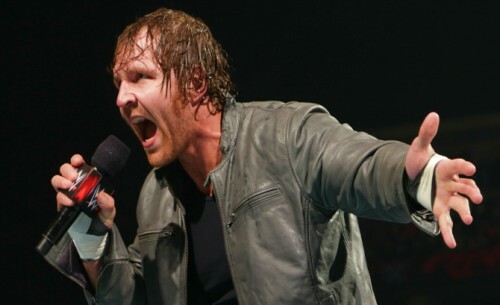 He has already been placed in a feud with the Intercontinental champion Kevin Owens which is likely to keep him away from the primary title hunt for the time being.This article analyses the reasons for Ambrose’s position in the WWE mid card. One of the main reasons that Ambrose might not make it to the WWE main event stage is because there is always a need for a ‘Hell of a hand’. A term described by Chris Jericho in his autobiography, ‘Hell of a hand’ is a wrestler who can be trusted to have an excellent match with any body on the roster, without ever rising to be the face of the company. Jericho fit in to that category during the final years of his inital WWE run, but was smart enough to take a break and come back rejuvenated. Wrestlers like John Morrison and Dolph Ziggler have been put in to the same category over the recent past and it seems like it is Ambrose’s turn to join them. While Ambrose’s matches have never been bad, one aspect that stands out is how he always succeeds in building a story in to all his feuds. Ambrose’s feud with Seth Rollins over the WWE World Heavyweight title had fans excited way more than any of Rollins’ previous rivalries. Even more impressively, it was Ambrose’s habit of walking away with Wade Barrett’s Intercontinental title that actually gave a backdrop to the IC tite ladder match at last year’s Wrestlemania. WWE Creative have absorbed all these and trusts Ambrose to have a good match and exciting story with any one that they might dump him with. Sadly, it also means that he is never considered to be ‘The One’ – merely the excellent worker who will always be good enough for an upper mid card status and nothing more. Yes – It is the worst kept secret in the WWE. Vince McMahon always prefers a certain type of wrestler to be his ‘man’. Ask the 300 pound monsters who had little mic skills, but became WWE Champions if you do not believe me. At 225 pounds, Dean Ambrose is definitely not in that category – even though he has a superb body, it isn’t the chiselled masterpiece that some one like Randy Orton has. True, Seth Rollins became WWE World Heavyweight Champion with a similar physique, but guys like him are merely exceptions that prove the rule. CM Punk has talked about how he was asked to put on weight during his early WWE days and how he reached more than 240 pounds at a time. Matt Hardy’s efforts to reach that ‘prototype body’ eventually saw the former Cruiserweight champion subjected to chants of ‘Fat Hardy’ during his final days in the WWE. Even if the dubious WWE Creative decides to look beyond Ambrose’s physical attributes, the Lunatic Fringe might just not make it to the WWE top rung just because there are a lot of main eventers already on the roster. John Cena, Randy Orton, Seth Rollins, Roman Reigns and Bray Wyatt have all been pushed way better than Ambrose and with part time in ring performers like Brock Lesnar, The Undertaker, Sting and even Triple H all available to make their presence felt once a big PPV comes up, the competition for the top spot is fierce. There would also be a steady influx of talent from NXT on to the main roster in the near future – with names like Sami Zayn, Finn Balor and Samoa Joe all rumoured to jump ship and if the WWE Creative has not been convinced of Ambrose’s main event status after three years on the roster, it is highly unlikey that they are going to start now. Ambrose has the best anti-establishment persona on the WWE roster. There are numerous instances of how superstars with such a gimmick have become widely popular and carried the company forward – No one better to prove this point than Stone Cold Steve Austin. Austin’s anti-employer persona gave WWE the momentum in the Monday night wars, but it isn’t Austin that Ambrose resembles accurately, but a former partner of the Rattlesnake – Brian Pillman. Pillman and Austin had formed a successful tag team called ‘Hollywood Blondes’ in WCW and Pillman started developing his ‘Loose cannon’ character in ECW as part of a talent exchange program and eventually in the WWE. While Pillman’s gimmick as the mentally unstable loudmouth was popular, the WWE Creative never felt that such a superstar could be portrayed as being the face of the company. Similar is the case with Ambrose. He seems to be the only guy in the roster who can reproduce Pillman’s role in the infamous ‘Shootout angle’ where Pillman drew a 9mm on Austin on national television. While it made the fans appreciate the raw intensity of Pillman, he was just not going to be in the main event. Austin, for all his antics, was a beer drinking Texan who would deliver a stunner on McMahon and his stooges regularly – There was no ‘unstable’ element associated with him unlike Ambrose and Pillman. During the time of the Monday night wars, the presence of WCW had kept WWE on its toes. The WWE Creative did not have the luxury to turn a blind eye towards what wrestling fans wanted as they knew that the fans would easily hop on the competitor’s bandwagon if they found that the product was not satisfactory. However, with the demise of WCW, that situation is no longer valid. Basically, WWE can continue to invest in storylines and wrestlers whom fans barely care about simply because they can. The WWE top brass knows that there is no alternative for the fans – none of the competitors are big enough and many of them do not offer anything of value. If this was the ‘Attitude era’, the likely scenario is that a fan favourite like Dean Ambrose would have been the WWE World Heavyweight Champion already. But Ambrose and the WWE Creative knows that there is no organization that can match his current salary and give him a global exposure. Sure, CM Punk might have walked out of the company, but he was already a multiple world champion and proven commodity. Ambrose needs to slug it out in the company a whole lot of time more to earn that status. As things stand, unless his poplualrity reaches such a level as to fans hijacking the show (similar to Daniel Bryan), Ambrose doesn’t seem to be in the running for a sustained presence at the WWE main event status.